The best paleo chocolate cupcakes are no longer a pipe dream…they are here…and they are good by ANYONE’S standards! Rich chocolate flavor, and a tender, spongy crumb! 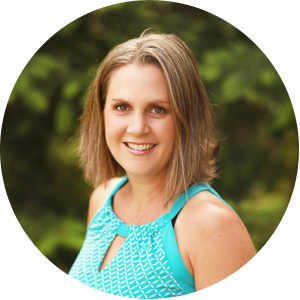 Come see how easy it is to make a totally grain free and delicious chocolate cupcake! 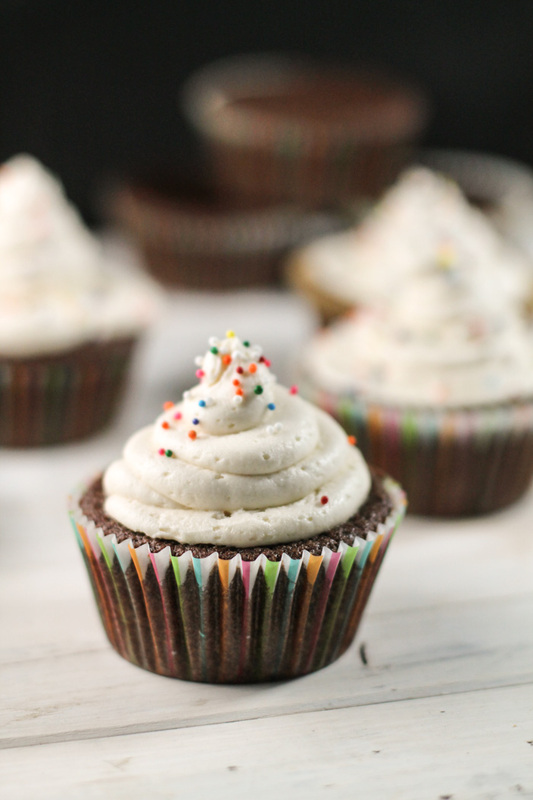 A delicious, moist, and paleo cupcake (or cake!) for you next celebration!! I am always striving to sneak some healthier foods into my kids’ treats….but until now the paleo chocolate cupcake had been a work in progress. As I have gained more experience working with these flours, I learned some of their unique traits and needs. But how to ensure a lovely moist crumb that I so adore?! As an added bonus, these have been vetted out by the ever picky ‘friends,’ category. They just think they are good cupcakes, period. I struggle with the pallets of some amigos, as they are used to store bought overly sweetened and sugared confections! When I was young, my grandma used to take a box mix of cake, and use a whole can of pears as part of the liquid. While I didn’t know why then, that cake was always one of my favorites!! It was so deliciously moist! Of course I now know that pureed fruits and vegetables can add that coveted moisture into any baked good. I am not sure why I didn’t think of it before, but I finally decided to use some applesauce as part of the liquid ingredients to create a really moist cake, and it worked beautifully. I have a hunch that other pureed fruits and vegetables would work too, I just have not tested them. How To Frost The Best Paleo Chocolate Cupcake!? 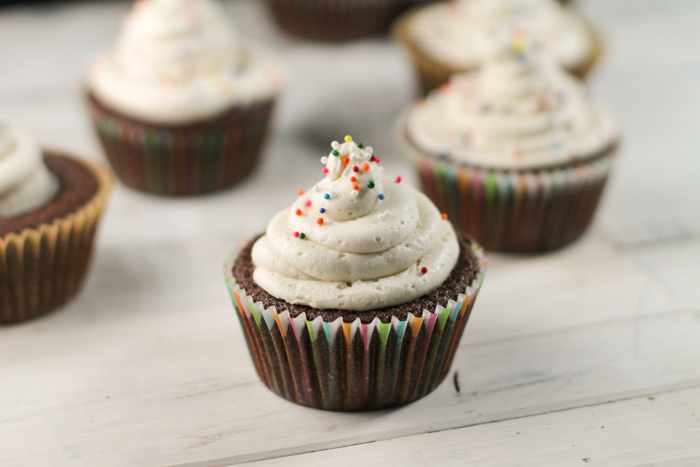 We have several frostings we rotate though….but you can top these beauties with any favorite frosting. For a simple frosting, I melt some dark chocolate and butter (or coconut oil) and add a few splashes of milk to thin. With a sprinkle of flaked sea salt, and a dash of vanilla…voila!! 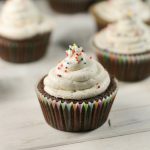 This chocolate avocado frosting is serious amaze-balls, no one would ever guess there is avocado in there! And my friend Erin, over @Texanerin Baking has a chocolate vegan frosting that looks to DIE for!! In these pictures, I used some regular sprinkles I had on hand that I purchased on accident online, thinking they were dyed with natural colors…wrong-o! As soon as opened the box…I knew I had not looked carefully enough at the labels before clicking ‘buy’! But they look pretty, so I went with it. a.) sprinkles don’t actually TASTE good to most people, they have a funky texture and zero flavor! b.) kids however, think everything is better with sprinkles. c.) sprinkles are NOT health food nor paleo, not even close! BUT, if you are a mom, and are making stuff for kiddos, sprinkles can be a fun and colorful addition!!! But artificial food dyes are no bueno for anyone…so we don’t make a habit of buying products containing them. These decorating sugars looks very pretty! These still have some questionable ingredients, but no food dyes! Here some homemade sprinkles with no nasties made from flaked coconut that are pretty darn beautiful in my book! Additional Chocolate Paleo Treats You Could Try! consider trying my Chocolate Hemp Zucchini Bread….it is a crowd favorite, made all in your blender!! Chocolate Avocado Cookies – Nut & Egg Free too! The chocolate version of my super popular and well loved Hail Merry Tart knock offs! Preheat oven to 350 degrees, prepare and grease a 12 space muffin pan. Alternately, line the spaces with paper baking cups. In the bowl of a mixer, mix all dry ingredients. In a glass measuring cup, mix all the remaining ingredients and pour into the dry mix. Mix well, beating for a couple of minutes. Evenly divide the batter, filling about 3/4 full. Bake in a preheated oven for 12-15 minutes until just set. DO NOT OVER-BAKE! Once completely cool, top with your desired frosting, or enjoy as is! I have ti find these cupcake liners! Love this recipe, so clean and easy! Perfect timing! Can’t wait to try these cupcakes this week! Oh, these look so delicious! Just in time for Valentine’s Day. These are so cute, and the ingredients are delicious! These are so cute and perfect for any kind of celebration! You had me at chocolate! Seriously cupcakes are awesome! Super fun – great ingredients! I bet they are super moist! Looking forward to trying them – we are coming into birthday season in my house! I can just tell these turn out perfectly! I love your recipe, so yummy, and what fun to make and present to loved ones. So special. They look so good! Who doesn’t love a chocolate cupcake?! Thank you for this great cupcake recipe! I know it takes a lot of perseverance to get something like this right, but it looks like you’ve nailed it! These look so cute! 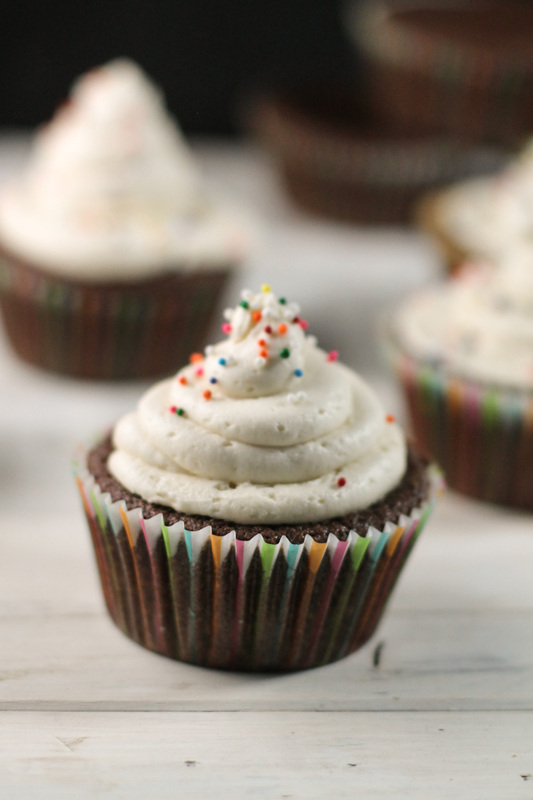 Love how you have given some suggestions for healthier sprinkles! These look so yummy! I love that you can enjoy a special occasion without all the junk. What a great, healthier Valentine’s treat. Can’t wait to dig in! The cutest cupcakes! Love how pretty that frosting is. I have everything I need for these! Just in time for dinner… haha.